# RDA-A3040 - Reducing Couplers x Adapters - Aluminum - 3 in. x 4 in. 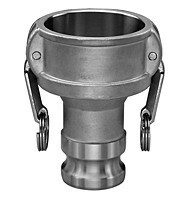 Under no circumstances should cam and groove couplings be used for compressed air or steam service! The coupler is the first size in the part number. Larger Sizes Available Upon Request. Coupler x Adapter 3 in. x 4 in.